A tomosynthesis exam is very similar to a traditional mammogram. Just as with a digital mammogram, the technologist will position you, compress your breast under a paddle and take images from different angles. 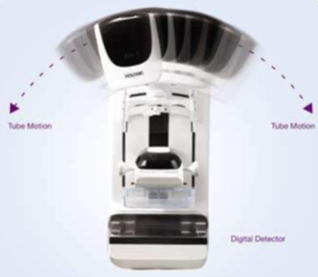 A breast tomosynthesis exam may be used as a screening tool in conjunction with a traditional digital mammogram or may be used by itself for a diagnostic mammogram. 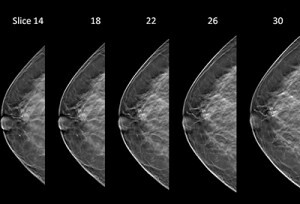 During the tomosynthesis portion of the exam, your breast will be under compression while the x-ray arm of the mammography machine makes a quick arc over the breast, taking a series of breast images at a number of angles. This will only take a few seconds and all of the images are viewed by the technologist at their computer workstation to ensure they have captured adequate images for review by a radiologist. The whole procedure time should be approximately the same as that of a digital mammogram. There is no additional compression required, and it only takes a few more seconds longer for each view. The technologist sends your breast images electronically to the radiologist, who studies them and reports results to either your physician or directly to you.